General Growth Properties (GGP) is a real estate investment trust with a 15B market cap that emerged from bankruptcy at the end of 2010 and has Bill Ackman/Pershing Square as an influential investor. Directly coming out of bankrupcy the company spun off Howard Hughes Corporation (HHC). The idea was that GGP contains the developed cash flow producing malls in a REIT structure, while HHC contains undeveloped assets and other types of real estate such as master planned communities. HHC has Bill Ackman as chairman, has a lot of insider ownership and the new CEO bought $15M of warrants when he joined the company. T2 values the company in this presentation between $77 and $141/share while the current price is $52. Maybe I’m going to do another write-up on HHC in the future, it’s also interesting, but the focus of this post is going to be on Rouse Properties. It’s a more recent spin off from GGP (spin off date was 12 January 2012). 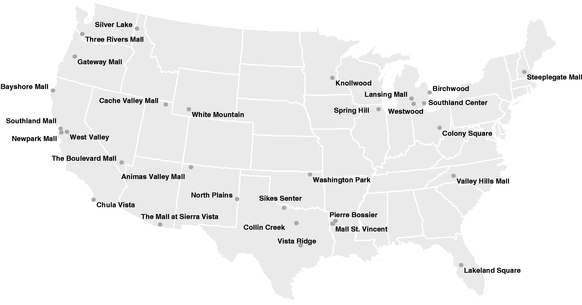 RSE is going to be an REIT and it contains 30 Class B malls located all over the USA. The B-malls have worse metrics such as tenant sales per square foot and occupancy rates than the other properties inside GGP, resulting in potentially improved public market valuation metrics for GGP post spin-off. A company presentation about the Rouse Properties spin-off can be found here. Share holders of GGP have received just 0.0375 shares of RSE for every GGP share, creating a classic spin-off situation were existing holders might decide to dump the new insignificant position. And there is some indication that that might be the case. The company is currently trading at roughly $12/share while it has planned a rights offering at $15/share to raise 200M in capital to redevelop and refresh properties. The rights offering will be back stopped by Brookfield Asset Management, a big asset management company that owns a 37.2% of GGP and as a result an equally big part of RSE. Brookfield has a lot of experience in real estate and would presumably not agree to backstop a $200M rights offering for just a $6M fee if it didn’t think the company wouldn’t be worth $15/share. Rights offerings are usually done at a discount to fair value to create an incentive to participate. Valuing real estate is not exactly my core competency (that’s arguably true for most things on this blog by the way! ), but the easiest way to value real estate is by looking at the cap rate: the expected yield a property will generate after subtracting operating costs and assuming it would be bought without leverage. If a fair yield for some property for example would be 10%, and the property would be generating 100.000 of income a year the value of the property would be 1 million. The previously linked company presentation contains indicative equity values based on the 2010 financials and cap rates between 7.5 and 8.5 percent. I created a quick excel sheet that gives us a equity value based on the most recent “Core NOI” (approx. 150M this year, down from 160M last year), various cap rates, subtracting the debt and adding back the cash that’s going to be raised. If we would assume that the range of cap rates that the company is using is reasonable it would imply that the equity is worth between $17 and 21$ per share: significantly more than the current $12 share price. Problem is that the company has a lot of debt and the valuation is quite sensitive to changes in cap rate or core net operating income (Core NOI). A cap rate around 8 percent seems pretty reasonable. GGP itself is currently trading for a bit less than 7 percent, but it also has higher quality properties so it deserves to trade at a lower cap rate. Another valuation check is to look at the book value of the real estate. The Form 10 filled before the spin-off contains the following table with balance sheet data: If we would take the investments in real estate at cost value/total assets as valuation, add the $200M in cash that is going to be raised and divide by the number of shares out standing post rights issue we get a share price of $13.3. Not as high as the valuation based on cap rate, but still above the current market price. Although RSE seems at the moment under valued, part of the under valuation is also the leverage at work. If we would assume an 8% cap rate the total real estate value is 1875M while the market is currently valuing it at 1560M: a discount of 17%. Because of the leverage this translates to a 43% discount in the share price, but the fundamental margin of safety is the underlying 17% discount. The value of real estate is less volatile than that of other asset classes and therefore having a relative high amount of leverage is not that problematic. A 65% LTV ratio is very common in commercial real estate, and buying real estate post the 2008 financial crisis in the USA doesn’t sound that bad. But before making any decision to buy or not I’m going to take a look at some other real estate companies, and figure out if there are better alternatives and if the leverage is acceptable to me or not. What do you think? None, but might initiate a position. This entry was posted in Research and tagged GGP, HHC, RSE on January 31, 2012 by Alpha Vulture. Looks like a good post, sorry I will have to come back again to read it more thoroughly in a day or two. However, wanted to ask if you have looked more closely at property companies listed in London? There are plenty of companies with v attractive discounts, and they have a lot less leverage! Not many with US exposure though, if that is what you prefer – Daejan Holdings (DJAN:LN) is the only one that immediately comes to mind. Have not yet looked really hard at alternatives available in London, but noticed that there seem to be some other cheap alternatives out there; and that’s certainly part of the reason why I’m not yet buying this. Good post. What are your thoughts on GGP post-spin? I don’t own currently although did purchase prior to bankruptcy and sold last year. However arguably, they may still be undervalued depending on how you see cap rates for their properties. They have kept the A-list properties and put the C-list into this entity. I’m going to look back at it again now that the spin-off is complete. The rights offering sounds interesting as another angle to the story. I haven’t really researched GGP: it’s a very big company that at first glance looks reasonably valued. RSE wants to raise cash to be able to improve the properties, that’s why they are doing a rights offering. BAM backstopping the rights offering is basically providing insurance that the company will be able to raise the cash. Presumably they are willing to offer this insurance because they are willing to increase their stake at the right offering price (with a discount because they get a fee for providing the insurance: they are paying 14.55/share if they buy the full 13.33M shares). One additional perspective is looking using the FFO multiple. If we look what the going rate FFO multiple is for retail REITs, we see it ranges between 14.6 – 16.2 . Post-rights issue, this would mean a value of around ~$15 – $16 which is on the lower end of yr estimate range. Finally, one could look at what the net value would be if you were to invest alongside BAM. BAM receives ~$6 Mln to backstop the offering, which translates into a net cost of $14.60/share assuming they’d be the sole subscriber to the rights issue. All in all these perspectives support your thesis. At today’s price of ~$14 I wouldn’t get in though as I’m not getting enough margin of safety: one key thing that bothers me is that Rouse’s management does not appear to have much skin in the game, so I’d need some more margin here. Good post, and agree with you that at todays prices there is not much of a margin of safety. I wouldn’t be too worried about management here though: the company has some strong share holders with Pershing Square/BAM. One thing that I think a lot of people are missing about this company is the growth potential. These assets seem to be underperforming as or right now and there should be plenty of room to grow. I haven’t down much research on this company but when I got interested in at 10.70 I thought it could easily be worth 20-30 a share post rights offering. Possibly in a couple of years time. Management wants to archieve 200M in core NOI in 2015, and if they are able to archieve that a equity price between 25~30 seems reasonable. I think it’s safe to assume that the management goal is the bull case, but there is no way to company should be worth that right now.